One of the most widely used forms of dental imaging is the bitewing x-ray. 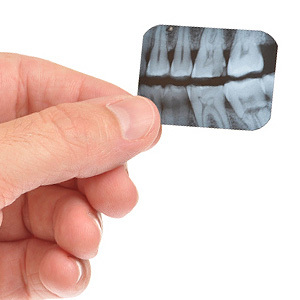 So called because of the shape of the device that holds the exposable film a patient clenches between their back teeth, the bitewing x-ray is an effective means for detecting the earliest stages of tooth decay. These early signs are small lesions on a tooth surface caused by mineral loss in the enamel. While we can identify them on front teeth through visual examination or bright lighting, they’re nearly impossible to see on the biting surfaces of back teeth. The bitewing x-ray solves this problem. During the procedure, a narrow beam of x-rays is directed at the back teeth area. Since X-rays can transmit through solid matter, they pass through the teeth and gums to expose the film attached to the bitewing assembly. X-rays pass through matter at different rates depending on the density of the tissue — a slower rate for harder tissues like teeth and bone and a faster rate for soft tissues like the gums. As a result, x-rays through teeth expose less of the film and appear as a lighter image than the gums. This difference is so precise even a tooth’s softer dentin appears slighter darker than its harder outer enamel. This precision helps us identify decay lesions. Because the lesions on the enamel are less dense than the normal enamel, they’ll appear as dark spots. By detecting them at this stage we have a better chance for reversing the effects of decay or at least minimizing damage that’s already occurred. Because x-rays emit radiation, there’s a natural concern about over-exposure and we go to great lengths to reduce it. Children may undergo a bitewing x-ray twice a year for developing teeth, while adults with healthy teeth are typically x-rayed just once a year. Advances in digital film and other technology have also helped lower the exposure rate. Today’s standard 4-film bitewing x-ray produces about four days worth of what we receive on average from normal background radiation, so the health risk is quite negligible. The benefit, on the other hand, is much greater — the early detection of tooth decay could ultimately save a tooth. If you would like more information on the use of bitewing x-rays in dental care, please contact us or schedule an appointment for a consultation. Enjoy all the advantages that getting dentures can offer you and your oral health. No one wants to deal with tooth loss but there are many dental issues that can destroy smiles. Fortunately, your Marietta, GA dentist Dr. James Hutson has options for giving you back that beautiful smile. Find out how dentures can improve your oral health and get your smile back. How can I benefit from dentures? With tooth loss it’s both difficult to feel confident speaking to those around you and difficult to speak properly. But through dentures you can get a full smile and find that speech is restored. Sure, it may take a few weeks to get used to your new teeth, but you’ll find over time that dentures make it easier to communicate with those you love. You may have found yourself straying from eating dinner out with friends or enjoying your favorite meals simply because it’s more difficult to eat foods without all your teeth. But just as dentures can restore your speech they can also make chewing easier. With your dentures, find renewed confidence in ordering all your favorite foods the next time you go out. An imperfect smile can certainly make you feel less than confident about your appearance. After all, a smile is often one of the first things people notice. Imagine the boost to your self-esteem that having a full smile will afford you. Tooth loss also poses other issues for your smile including an altered facial structure. Wearing dentures can help your cheeks maintain their fullness. If you are ready to say goodbye to tooth loss for good, then it’s time to schedule a consultation with your dentist in Marietta. Call our office today and let us know you are interested in getting dentures.